Star Wars Live Action TV Series? There is a rumor that LF is working bringing the long awaited TV series STAR Wars: Underworld to the small screen around 15 December 2018...and the IMDB page for SW: Underworld has been updated with a few details to this effect. Now I know that the Star Wars: Underworld page has been updated because I have been checking it every couple of months and there have been recent updates added to the page which were not there before. For example, the story line wasn't there before- Follows the journeys of a young bounty hunter and his mentor, as they transport shipment around the galaxy, encountering huge threats along the way. 1. The IMDB page was changed and nobody has attempted to change it or confirm an error. 2. The Han Solo movie gets released in May 2018 and it has yet to be shifted to December (so it might now be too late to shift the movie release date)...this leaves December free. They might be keeping December free for something big promoting like a live action TV series. 3. The premise of the show matches a story line that was supposed to be used in TCW, showing bounty hunter Cade Bane training a young Boba Fett after his father dies. His motive is not altruistic- Jango Fett was his rival and was killed before they could determine who was the better bounty hunter so Cad Bane decides to train Boba and then compete with him to decide once and for all who is the better bounty hunter. The story would be interesting as Cad Bane is based on Lee Van Cleef's character in the Good, the Bad and the Ugly, while Boba is based on Clint Eastwood's character in The Man with No Name. 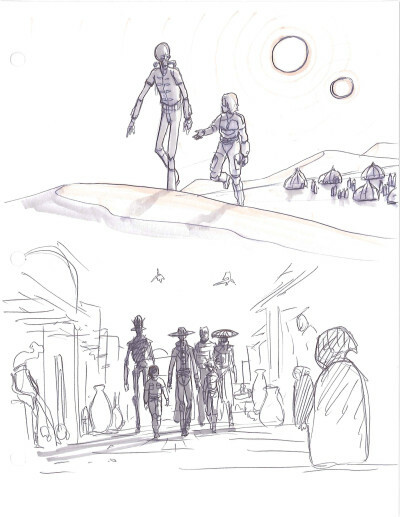 There is concept sketches for this story (by Dave Filoni) as well as an unfinished TCW video clip, shown at SWC 2015. Maybe they initially wanted to make a Boba Fett movie but then decided it would be better as a TV series? 4. Dave Filoni was recently replaced as Supervising Director of SW Rebels to work on other projects...one automatically assumes its a new animation but what if it is actually a live action TV show? 5. A live action series would definitely attract a lot more of the GA than an animated show on the Disney channel, as a lot of people pereive Rebels as a show only for kids, and want something grittier for adults. Bounty Hunters, smugglers and the criminal underworld in general is perfect or this....and some o the Han Solo cast members could make cameo or guest appearances in the show as the time lines would match up (like some the marvel movie characters make brief appearances in TV shows like Agents of Shield).